A Jewelry Artisan from the time of the pharaohs, to the time of the Caesars, to the time of the high Middle Ages, to now, has made jewelry the same way. Now Arden Jeweler’s artists, with computer technology, are producing world class Jewelry in a whole new way. Picture a chunk of marble; inside that marble is David. It took the genius of Michelangelo to bring him out. Today with computer technology and the skills to use it, we can produce masterful jewelry. The traditional method for creating jewelry, especially rings, is by taking a piece of wax, then building it up and carving it by hand to the desired shape. This process is very time consuming. It is almost impossible to get a perfectly symmetrical ring. In the past the client was forced to choose a piece of jewelry that was mass produced…But now our consumer has the ability to get custom designed jewelry without paying the high custom jewelry prices. We are now creating jewelry on various 3D CAD CAM programs. CAD means computer aided design, and CAM means computer aided manufacturing. There are several benefits for working with CAD CAM programs. They give a completely dimensionally accurate piece of jewelry from start to finish. This means that the jewelry is able to be designed to very precise standards. If the ring is supposed to be the same on both sides of the y axis, or center of the ring, it will be. Matrix is the high end CAD CAM program we use. It gives our designers the ability to create a unique line of jewelry. With Matrix we can show our clients what the ring will look like when it is done on the screen before any wax is made. A client comes in and has an idea for a ring. After conversing with the jewelry designer, and describing the ring to him, the jewelry designer starts to design the ring. When he has a prototype for the customer to look at he renders it, which means he creates a photo-realistic image of the solid model. This rendering process has many elements as well, such as lighting, background, props and the list goes on. All of these elements come together to create a lifelike image of the ring for the client, all before any materials have been used. Now the client can see if he likes it or not before the wax model is made. However, if the client wants to change the design now that he sees what the ring will really look like, the jewelry designer can change it without starting over from scratch. He can make the specific modifications in Matrix, and render another image of the ring. The traditional wax carver would have to make an entirely new wax model. And what if the customer still was not satisfied, this process could get extremely time consuming, and expensive. With the power of CAD CAM programs, you are the artist and the jewelry designer is the client’s hands. 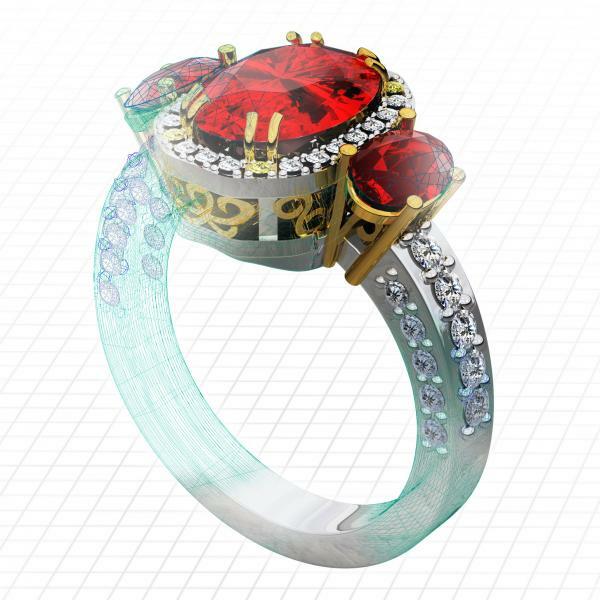 Another advantage of our computer design program is that individualization of jewelry is possible. In the past the client was forced to choose a piece of jewelry that was mass produced by large scale design companies, or face paying a premium for a custom designed piece of jewelry. But now our consumer has the ability to get custom designed jewelry without paying the high custom prices. Our goal is to make world class jewelry for our clients in a fast timely matter and at a great price. The future of jewelry is at Arden Jewelers and it its looking good for all our friends and clients. Stop by today to see what our designers are working on, or you can checkout our online custom jewelry gallery.